Robots – are they just a thing of the future? Many in the agriculture sector agree that the industry is heading in the direction of having more technology on the farm, which could even include robots. In fact, there are already several companies that have made significant strides in creating robotic systems for use in agriculture that are either in field-testing stages or already entering the market. At the recent Yuma Ag Summit held in February 2018 in Yuma, AZ, several systems were on display or discussed at the event. There is a lot of interest in this type of technology in regions such as Arizona and California, where a lot of produce and specialty crops are grown. These crops often require intensive hand-labor, but labor shortages in the industry have created a problem for farmers. This problem could potentially be solved by robots that could make up for those shortages. Vision Robotics, based in San Diego, CA, has been developing robotic systems specific to agriculture for several years and is a company that currently has products on the market. Their products include a vineyard pruner that images vines and uses a robotic arm to thin plants, as well as an automated lettuce thinner. Looking back, it’s amazing to see how the agriculture industry has evolved. For example, in March 2018, John Deere Co. celebrated manufacturing tractors for exactly 100 years. This is a big milestone for the company, but also shows how the industry has grown in a relatively short period of time. Precision agriculture technology as we know it, such as GPS and autosteer, are relatively new advancements, having been largely adopted around 15 years ago. 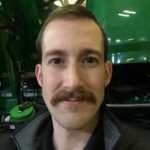 I think most people in the industry would agree that robots have a place in the future of agriculture, and we may be surprised by how quickly these systems will become commonplace in the industry. There are many opportunities for technology companies to develop products that will solve problems and bring value — from planting fields, maintaining crop health, to even harvesting. While there are some systems already on the market, this is likely the tip of the iceberg of what we’ll see in coming years. Thank you, Nate Dorsey, for highlighting some innovations in robotics for agriculture. I couldn’t agree with you more…this is the future of large- and small-scale agriculture, and even indoor, urban, tiered agricultural systems that are emerging in refitted warehouses. Robotics will continue to provide important support tools to the farmers of today and of the future.